Choose from our huge selection of 100% cotton and cotton blend and Cotton Print Fabrics.Perfect for many decorating projects including bedding, drapery, pillows, and more. Available in hundreds of patterns and colors. 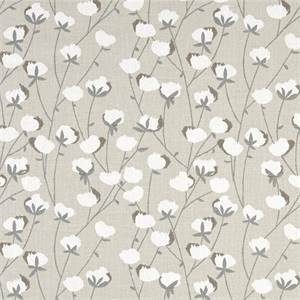 Cotton Belt Clay Gray Drapery Fabric by Premier Prints - 30 yard bolt This lovely fabric offers a fresh spin on the floral theme. It features a simple and charming cotton plant design in gray, white, and with touches of slate blue. It is suitable for many applications, including draperies, bedding, pillows, upholstered / padded headboards, light-weight upholstery and much more. This fabric is 100% cotton and is manufactured in Mississippi making it a perfect choice for a home in the South!&nbsp;Price is for a 30 yard bolt. 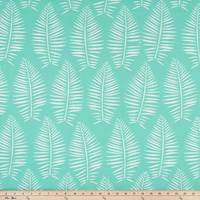 Outdoor Breeze Surfside Fabric by Premier Prints 10 Yard Bolt Breeze Surfside features a stylized leaf design in light blue-green and off-white. This tropical-themed fabric is a great choice for a variety of home decor applications, both inside and outside! It is fade resistant and can be used for porch draperies or outdoor furniture cushions. It has been treated to make it resistant to water, dirt, mildew and stains making it a great choice for high-traffic indoor areas as well. This fabric has so many useful applications including pillows, cushions, light-weight upholstery, shower curtains, placemats, beach bags and much more. Made with 100% spun polyester. Printed in the USA. SOLD BY THE 10-YARD BOLT. 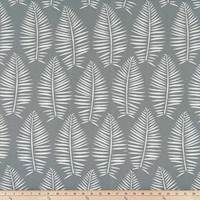 Outdoor Breeze Sea Salt Fabric by Premier Prints 10 Yard Bolt Breeze Sea Salt features a stylized leaf design in gray and off-white. This tropical-themed fabric is a great choice for a variety of home decor applications, both inside and outside! It is fade resistant and can be used for porch draperies or outdoor furniture cushions. It has been treated to make it resistant to water, dirt, mildew and stains making it a great choice for high-traffic indoor areas as well. This fabric has so many useful applications including pillows, cushions, light-weight upholstery, shower curtains, placemats, beach bags and much more. Made with 100% spun polyester. Printed in the USA. SOLD BY THE 10-YARD BOLT. 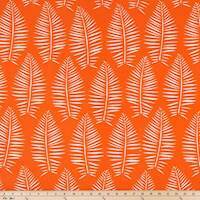 Outdoor Breeze Marmalade Fabric by Premier Prints 10 Yard Bolt Breeze Marmalade features a stylized leaf design in orange and off-white. This tropical-themed fabric is a great choice for a variety of home decor applications, both inside and outside! It is fade resistant and can be used for porch draperies or outdoor furniture cushions. It has been treated to make it resistant to water, dirt, mildew and stains making it a great choice for high-traffic indoor areas as well. This fabric has so many useful applications including pillows, cushions, light-weight upholstery, shower curtains, placemats, beach bags and much more. Made with 100% spun polyester. Printed in the USA. SOLD BY THE 10-YARD BOLT. 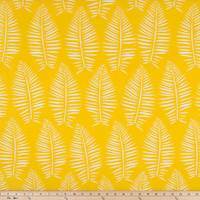 Outdoor Breeze Pineapple Fabric by Premier Prints 10 Yard Bolt Breeze Pineapple features a stylized leaf design in bright yellow and off-white. This tropical-themed fabric is a great choice for a variety of home decor applications, both inside and outside! It is fade resistant and can be used for porch draperies or outdoor furniture cushions. It has been treated to make it resistant to water, dirt, mildew and stains making it a great choice for high-traffic indoor areas as well. This fabric has so many useful applications including pillows, cushions, light-weight upholstery, shower curtains, placemats, beach bags and much more. Made with 100% spun polyester. Printed in the USA. SOLD BY THE 10-YARD BOLT. 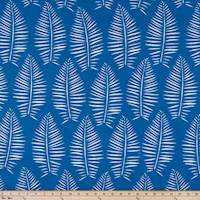 Outdoor Breeze Admiral Fabric by Premier Prints 10 Yard Bolt Breeze Admiral features a stylized leaf design in blue and off-white. This tropical-themed fabric is a great choice for a variety of home decor applications, both inside and outside! It is fade resistant and can be used for porch draperies or outdoor furniture cushions. It has been treated to make it resistant to water, dirt, mildew and stains making it a great choice for high-traffic indoor areas as well. This fabric has so many useful applications including pillows, cushions, light-weight upholstery, shower curtains, placemats, beach bags and much more. Made with 100% spun polyester. Printed in the USA. SOLD BY THE 10-YARD BOLT. 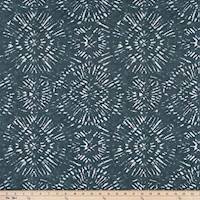 Outdoor Borneo Slate Blue Fabric by Premier Prints 10 Yard Bolt Borneo Slate Blue features a contemporary medallion design in dark blue and off-white. This tropical-themed fabric is a great choice for a variety of home decor applications, both inside and outside! It is fade resistant and can be used for porch draperies or outdoor furniture cushions. It has been treated to make it resistant to water, dirt, mildew and stains making it a great choice for high-traffic indoor areas as well. This fabric has so many useful applications including pillows, cushions, light-weight upholstery, shower curtains, placemats, beach bags and much more. Made with 100% spun polyester. Printed in the USA. SOLD BY THE 10-YARD BOLT. 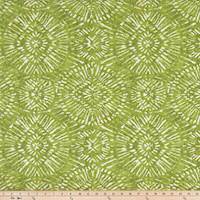 Outdoor Borneo Greenery Fabric by Premier Prints 10 Yard Bolt Borneo Greenery features a contemporary medallion design in a green color. This tropical-themed fabric is a great choice for a variety of home decor applications, both inside and outside! It is fade resistant and can be used for porch draperies or outdoor furniture cushions. It has been treated to make it resistant to water, dirt, mildew and stains making it a great choice for high-traffic indoor areas as well. This fabric has so many useful applications including pillows, cushions, light-weight upholstery, shower curtains, placemats, beach bags and much more. Made with 100% spun polyester. Printed in the USA. SOLD BY THE 10-YARD BOLT. 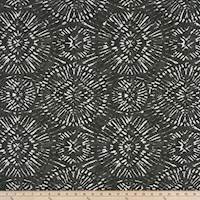 Outdoor Borneo Matte Fabric by Premier Prints 10 Yard Bolt Borneo Matte features a contemporary medallion design in black and off-white. This tropical-themed fabric is a great choice for a variety of home decor applications, both inside and outside! It is fade resistant and can be used for porch draperies or outdoor furniture cushions. It has been treated to make it resistant to water, dirt, mildew and stains making it a great choice for high-traffic indoor areas as well. This fabric has so many useful applications including pillows, cushions, light-weight upholstery, shower curtains, placemats, beach bags and much more. Made with 100% spun polyester. Printed in the USA. SOLD BY THE 10-YARD BOLT. Outdoor Borneo Basket Fabric by Premier Prints 10 Yard Bolt Borneo Basket features a contemporary medallion design in a natural color. This tropical-themed fabric is a great choice for a variety of home decor applications, both inside and outside! It is fade resistant and can be used for porch draperies or outdoor furniture cushions. It has been treated to make it resistant to water, dirt, mildew and stains making it a great choice for high-traffic indoor areas as well. This fabric has so many useful applications including pillows, cushions, light-weight upholstery, shower curtains, placemats, beach bags and much more. Made with 100% spun polyester. Printed in the USA. SOLD BY THE 10-YARD BOLT. 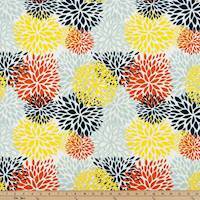 Outdoor Blooms Perla Fabric by Premier Prints 10 Yard Bolt Blooms Perla features a dahlia-like floral design in orange, yellow, and blue on an off-white background. This flower-themed fabric is a great choice for a variety of home decor applications, both inside and outside! It is fade resistant and can be used for porch draperies or outdoor furniture cushions. It has been treated to make it resistant to water, dirt, mildew and stains making it a great choice for high-traffic indoor areas as well. This fabric has so many useful applications including pillows, cushions, light-weight upholstery, shower curtains, placemats, beach bags and much more. Made with 100% spun polyester. Printed in the USA. SOLD BY THE 10-YARD BOLT. 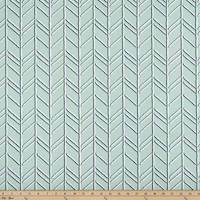 Outdoor Bogatell Blue Stone Fabric by Premier Prints 10 Yard Bolt Bogatell Blue Stone features a chevron-like striped design in blue and off-white inspired by bamboo stalks. This tropical-themed fabric is a great choice for a variety of home decor applications, both inside and outside! It is fade resistant and can be used for porch draperies or outdoor furniture cushions. It has been treated to make it resistant to water, dirt, mildew and stains making it a great choice for high-traffic indoor areas as well. This fabric has so many useful applications including pillows, cushions, light-weight upholstery, shower curtains, placemats, beach bags and much more. Made with 100% spun polyester. Printed in the USA. SOLD BY THE 10-YARD BOLT. 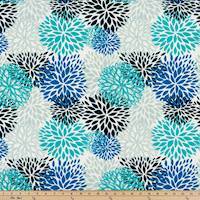 Outdoor Blooms Blue Vista Fabric by Premier Prints 10 Yard Bolt Blooms Blue Vista features a dahlia-like floral design in various shades of blue on an off-white background. This flower-themed fabric is a great choice for a variety of home decor applications, both inside and outside! It is fade resistant and can be used for porch draperies or outdoor furniture cushions. It has been treated to make it resistant to water, dirt, mildew and stains making it a great choice for high-traffic indoor areas as well. This fabric has so many useful applications including pillows, cushions, light-weight upholstery, shower curtains, placemats, beach bags and much more. Made with 100% spun polyester. Printed in the USA. SOLD BY THE 10-YARD BOLT. 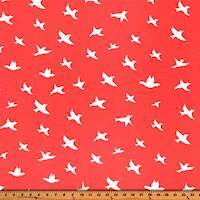 Outdoor Bird Silhouette Indian Cor Fabric by Premier Prints 10 Yard Bolt Bird Silhouette Indian Coral features a repeating flying-bird design in coral and off-white. This fabric is a great choice for a variety of home decor applications, both inside and outside! It is fade resistant and can be used for porch draperies or outdoor furniture cushions. It has been treated to make it resistant to water, dirt, mildew and stains making it a great choice for high-traffic indoor areas as well. This fabric has so many useful applications including pillows, cushions, light-weight upholstery, shower curtains, placemats, beach bags and much more. Made with 100% spun polyester. Printed in the USA. SOLD BY THE 10-YARD BOLT. 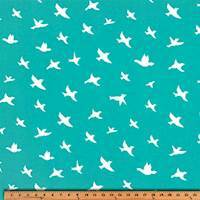 Outdoor Bird Silhouette Ocean Fabric by Premier Prints 10 Yard Bolt Bird Silhouette Ocean features a repeating flying-bird design in blue-green and off-white. 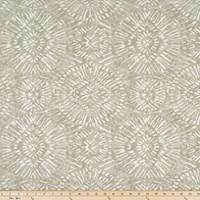 This fabric is a great choice for a variety of home decor applications, both inside and outside! It is fade resistant and can be used for porch draperies or outdoor furniture cushions. It has been treated to make it resistant to water, dirt, mildew and stains making it a great choice for high-traffic indoor areas as well. This fabric has so many useful applications including pillows, cushions, light-weight upholstery, shower curtains, placemats, beach bags and much more. Made with 100% spun polyester. Printed in the USA. SOLD BY THE 10-YARD BOLT. 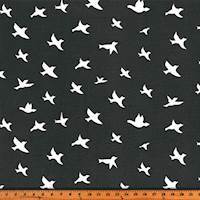 Outdoor Bird Silhouette Cavern Fabric by Premier Prints 10 Yard Bolt Bird Silhouette Cavern features a repeating flying-bird design in black and off-white. This fabric is a great choice for a variety of home decor applications, both inside and outside! It is fade resistant and can be used for porch draperies or outdoor furniture cushions. It has been treated to make it resistant to water, dirt, mildew and stains making it a great choice for high-traffic indoor areas as well. This fabric has so many useful applications including pillows, cushions, light-weight upholstery, shower curtains, placemats, beach bags and much more. Made with 100% spun polyester. Printed in the USA. SOLD BY THE 10-YARD BOLT. 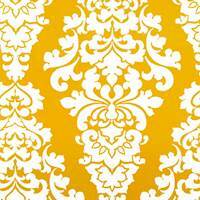 Outdoor Berlin Yellow Fabric by Premier Prints 10 Yard Bolt Berlin Yellow features a large floral damask design in bright golden-yellow. This fabric is a great choice for a variety of home decor applications, both inside and outside! It is fade resistant and can be used for porch draperies or outdoor furniture cushions. It has been treated to make it resistant to water, dirt, mildew and stains making it a great choice for high-traffic indoor areas as well. This fabric has so many useful applications including pillows, cushions, light-weight upholstery, shower curtains, placemats, beach bags and much more. Made with 100% spun polyester. Printed in the USA. SOLD BY THE 10-YARD BOLT. 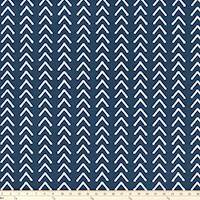 Boho Vintage Indigo Drapery Fabric by Premier Prints - 10 Yard Bolt Dark or navy blue and off-white 100% cotton printed fabric. Ideal as drapery fabric, pillow fabric, cushion fabric, light-weight upholstery, crafts (such as bags, aprons, etc) and much more. Printed in the USA. Sold by the 10-Yard Bolt. 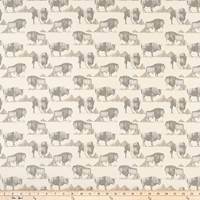 Buffalo Trail Lead Macon Drapery Fabric by Premier Prints - 10 Yard Bolt Natural and ivory 100% cotton printed fabric. Ideal as drapery fabric, pillow fabric, cushion fabric, light-weight upholstery, crafts (such as bags, aprons, etc) and much more. Printed in the USA. Sold by the 10-Yard Bolt.